First off let me start by saying that I am no expert in finance and economics, and that, therefore, I myself am just trying to understand what happened. And this just because of the obvious importance—not only from a financial point of view, but also from a political (and social) one—of what actually happened. That being said, let’s face it. UniCredit SpA Chief Executive Alessandro Profumo liked to say he wanted to keep his job heading Italy’s biggest bank (or the second biggest after Intesa San Paolo, according to some sources) until he is 60. But his tenure came to an abrupt end some 7 years ahead of that deadline: the 53-year-old architect of UniCredit’s relentless growth from regional Italian bank to a global financial giant resigned on Tuesday at an extraordinary board meeting called by the chairman, Dieter Rampl. Disgruntled shareholders forced Profumo out in a dispute over Libya’s growing influence on the bank and lagging results. The company confirmed the resignation in a statement distributed by the Italian stock exchange. Profumo will be replaced, temporarily, by chairman Dieter Rampl, who is also the former head of Germany’s second-biggest bank HVB, which was acquired by UniCredit in 2005. It is also to be said that UniCredit was the most exposed Italian bank in the global financial meltdown which began in late 2007, and this just because it had the biggest international profile, including owning the HVB group, which suffered in the subprime loan crisis that sparked the credit crunch. UniCredit was recently assigned a banking license by the Central Bank of Libya to operate in that country. Mr. Profumo said this month that Libyan investors chose to “autonomously” build their stakes in UniCredit. But the increase in the Libyan stake infuriated some Italian officials. The question of Libya’s voting rights — and whether the two Libyan shareholdings should be treated as one entity — is being examined by Italian regulators. UniCredit’s bylaws state that no single shareholder should control more than 5 percent of the votes. The other main shareholders in UniCredit are Aabar Investments, an Abu Dhabi state entity with 4.9 percent, and the four regional Italian bank foundations — based in Verona, Turin, Bologna and Treviso — which together control about 10 percent. German companies including the insurer Allianz also hold significant minority stakes in UniCredit. The American investment firm BlackRock holds 4 percent. to which UniCredit’s shareholders had been accustomed; and the bank had to make calls for fresh capital, bringing hard times to the philanthropic foundations that had owned the five savings banks and which now own a combined stake of about 12% in UniCredit. As the savings banks themselves had once been, the foundations are political as well as philanthropic, with boards made up of party appointees and local bigwigs. Cuts in dividends from UniCredit have meant less largesse for them to bestow on good works such as repairing church roofs, helping hospitals and funding old people’s homes, and also less influence. The share-buying in UniCredit by two arms of Muammar Qaddafi’s regime, coming on top of recent stake-building by another Arab government—that of Abu Dhabi—has caused indignation in northern Italy, where the xenophobic Northern League political party is strong. In fact, Flavio Tosi, a League governor and Verona’s mayor, said Profumo should have stopped the Libyans at 5%. “I’m not a banker,” he said, “but to let in partners like Gaddafi and the Libyans means letting in partners who may not have the [same] interests as Verona and the Veneto.” He also accused the bank of focusing on business abroad at the expense of Italian enterprises, which need help recovering from the world economic crisis. 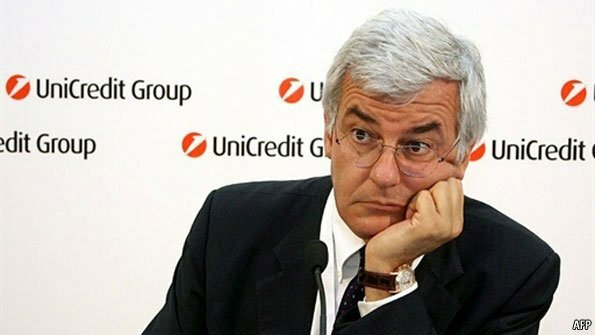 Yet, now Northern League leader Umberto Bossi is urging foundation shareholders of UniCredit to defend the company against the growing German influence: “I hope the foundations don’t stand there with their hands in the pockets, but that they organize a defence,” he said. Doesn’t it seem a bit contradictory? The most vocal opponents of Profumo—his departure is a significant victory for the foundations, and for the federalist Northern League party—are now worrying about the consequences of their political fight. I just don’t understand. "The Bank of Italy urged UniCredit SpA, Italy’s largest bank, to move quickly in naming a successor to Chief Executive Officer Alessandro Profumo, three people with knowledge of the matter said." "The Rome-based central bank, in a letter, asked UniCredit to explain the executive powers assumed by Chairman Dieter Rampl, who replaced Profumo as interim CEO yesterday, said the people, who declined to be identified because the communication was private. The Bank of Italy called for a “rapid” return to stability and asked for information on Profumo’s compensation, they said."